The majority of us spend a large amount of our day sitting. We sit at the office, on the ride to and from work, and on the couch at the end of a long day. Poor posture while sitting can lead to back pain and makes your day uncomfortable. By investing in a lumbar support for your car seat, you can start to eliminate back troubles. One of the biggest contributors to pain in the lumbar region is improper posture. The way that most of us sit and stand puts our spines, and, therefore, our backs, into a position that will cause pain over the long term. It is easy to work on your posture while you are standing, you can adjust the placement of your feet, shoulders, and neck. It is even fairly easy to fix your posture while you sit in a desk chair by replacing the chair for one with a more ergonomic design. You can’t just replace your car seat though, and because many of us spend a good amount of time in the car, our posture in a car seat can negatively affect our backs. We all hear it again and again, we need to exercise more. Not only does exercise help you lose weight and maintain overall health, it can also help with back pain. More than likely, you spend most of your day sedentary. You might work a desk job or spend a lot of time traveling. No matter what you do, sitting still all day can cause your lower back to ache. When you are sitting, you lock your back and spine into a certain position. Choosing the right kind of chair or support for your chair can help you ease some of the problems that happen when you sit. What Does A Lumbar Support Do? When you sit into a car seat, you are put into whichever position the make of the chair provides. Most often this is not an ideal sitting posture. With other chairs, like a desk chair or a kitchen chair, you can switch the seat to get a better alignment for your back. Unfortunately, you can’t just switch out the seat of your car. A good lumbar support will help place your lower back into the proper alignment. It will help you keep your natural curve so that you have good posture. When your lumbar region is properly aligned, the rest of your back and spine fall into place. If you do not have good support on your lumbar region, you might be putting unnecessary pressure onto your lower back. By using a lumbar support in your car, you can ease some of the pressure by providing a soft yet stable surface for your lower back to rest on. If you have ever been on a long car trip, you know that your back can start to ache and even seize up. A lumbar support can help eliminate this pain and tightness. When you sit in a car seat without a lumbar support your lower back has nothing to rest against and as the muscles start to tire, your back will round towards the chair. Rounding your back not only gives you poor posture, it can put your lumbar region in a very vulnerable position. You are more likely to sustain a long-term ache with a rounded back. A lumbar support can help you avoid this problem. Are There Different Kinds Of Lumbar Support? For the most part, all lumbar supports are generally the same. Their shape and size can vary a little, but they will all be fairly similar. The material they are made of is going to be the biggest difference. You can choose which type will work best for you and your back. This is the most popular material for lumbar support cushions. Memory foam is a high-density foam that will actually mold itself to the contours of your body. It is soft but still very supportive and will cushion your lumbar region while keeping it stable. Memory foam is also lightweight and very durable so it is easy to move and will last for a long time. The only major complaints about memory foam is that it can retain heat. For a long car ride, this might get uncomfortable. It can also be a little more money than other materials, but you will be getting a high-quality product. This material isn’t as popular as memory foam, but you can still find lumbar supports that are made of plastic. A lumbar support that is made of hard plastic will provide a very sturdy support system so if you need a lumbar support that is more rigid than what memory foam can provide, you might want to use one with hard plastic. You can also find a lumbar support that has a wire or metal frame and is then covered with either regular or memory foam. Adding that extra support under the foam might be the best bet if you have a really weak back. Will It Be An Expensive Purchase? It all depends on the type of lumbar support cushion you decide to buy. The general range for a lumbar cushion is anywhere between $25 to $50. Supports that are made with memory foam tend to be on the higher end of the price range while regular foam or mesh will cost less. Remember that cheaper might not always be better when it comes to your back. A lumbar support that doesn’t help place your lower back in the right alignment can hurt you even more. You want to make sure that you find a quality product that will help your problem, not make it worse. This lumbar support cushion is made of memory foam and comes with a removable mesh cover. The mesh cover helps keep the cushion, and you, cooler and it’s also easy to wash. There is also a nylon strap that comes with this cushion so that you can strap it to whatever chair you are using. This is a nice feature because it keeps the lumbar support stable so you don’t have to constantly be adjusting the cushion. The strap can be tightened and loosened, so it fits well in pretty much any car. The ERGO-Pedic lumbar support cushion is a little stiffer than some other memory foam cushions, but that is good for people who need a lot of extra support. This cushion is also less expensive than others and small enough to make traveling with it easy. The Desk Jockey lumbar support cushion is a memory foam support that comes with a velour cover. The cover can be removed and washed and helps provide extra comfort to the cushion. There is also an adjustable strap to keep the cushion in place while you’re using it. This cushion not only helps keep the natural curve in your lower back but it also aligns your hips, upper back, and shoulders. The cushion is a firm memory foam, but after you have been sitting in it for a while it softens a little to mold to your body. If you want a cushion that stays stiff no matter how long you use it, you might need a different cushion. This support is also on the lower end of the price range for lumbar supports and comes with a 100% money back guarantee. If you don’t like this cushion after you have tried it out, Desk Jockey will fully refund your purchase. 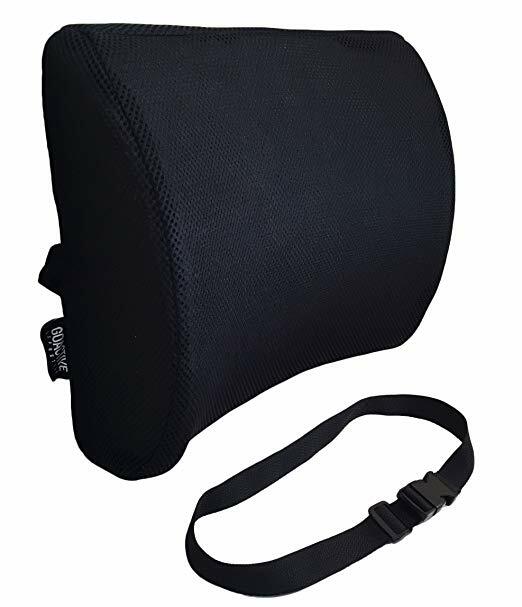 This lumbar support cushion will help you sit with good posture so that you can eliminate any stress that you have on your lower back. It is made with memory foam and has a ventilated mesh covering. The mesh helps keep the memory foam cool so you don’t get too hot while you’re sitting and it can be removed for washing. This cushion is a little smaller than other lumbar supports, which makes it easy to carry wherever you need to go, but it might be a little too small for larger adults. It also has a buckle strap to keep it in place while you’re sitting but unlike other cushions it comes with an extension strap. This works really well for people with larger than normal car seats. The BackGuard premium lower back pain cushion helps ease back pain by allowing you to support the natural curve of your lower spine. It is made of high-density memory foam so it will firmly support your back but still mold to your shape to provide comfort. This cushion has a combination velour and mesh pillow cover so that you can keep your lower back cooler during long use. The BackGuard lumbar cushion is made without chemicals, so it doesn’t have the unpleasant odor that some other memory foam cushions might have. It also has an adjustable strap to keep it perfectly in place. The BackGuard cushion is a little more expensive than other lumbar cushions, but it does come with a 90-day money back guarantee. If after trying this pillow for 90 days you don’t like it, you can send it back for a full refund. The Love Home premium car lumbar pillow is a full back pillow that cushions and supports not just your lumbar region but the upper back as well making sure everything is in alignment. It is made of memory foam to mold perfectly to your back as well as support it. There is a removable mesh cover that comes in three different colors so it can match your car seat. There is no strap for the lumbar pillow, so you might need to adjust it. It does sit back into the natural curve of your car seat to try and eliminate any movement as you use it. The nicest thing about this pillow is that it comes with a free neck pillow that straps to the head of your car seat. The whole system puts your spine and neck into the best position possible and makes long car trips more tolerable.